African Cyber Gaming League (ACGL) have been busy of late. They recently announced their second Afresports event and also launched their trendy esports app. If you thought they were done, you’d be in for a bit of a surprise. They’ve just announced The Injustice 2 Legendary Series (on PlayStation 4), in partnership with GameFinity. The Legendary Series is cut into three segments; The qualifiers, the Legendary League and the Grand Finals. There will be over R12,000 in cash prizes up for grabs throughout the tournament. Essentially, the top two players from each qualifier round will progress to the Legendary League. Then the top four players from the Legendary League progress to the Grand Finals. The qualifiers will be a double elimination Best-of-Three format. The Legendary League, however, is a round-robin format. The format for the Grand Finals is still to be confirmed. Additional R1,000 available per each qualification round (1st: R600 & 2nd: R400). First qualifier: 8 September 14h00. Second qualifier: 15 September 14h00. Third qualifier: 22 September 14h00. Fourth qualifier: 30 September 14h00. Registrations for the first qualifier are live right now, so head over to ACGL to sign up. 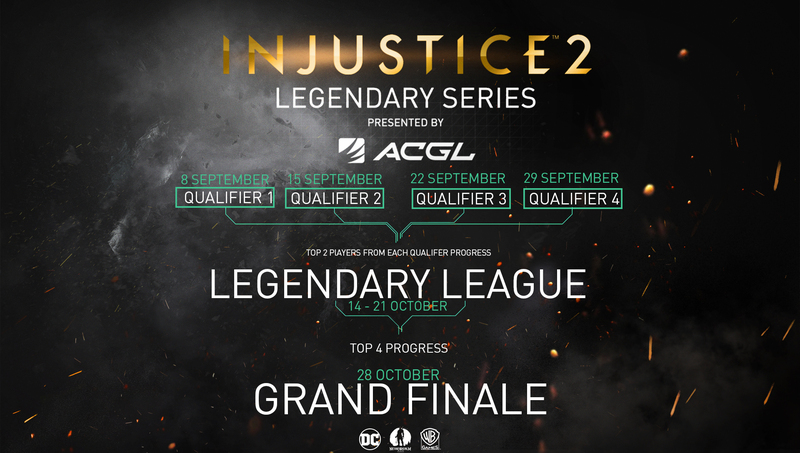 The Injustice 2 Legendary Series will host four online qualifiers, wherein each qualifier the participants will be competing for an R1,000 prize pool. Not only will there be cash up for grabs, the top two players in each of the respective qualifiers will earn their place in the Legendary League where an additional R8,500 in cash prizes up for grabs. Should a player place in the Top 2 in one of the qualifiers they will not be allowed to play in the remaining qualifiers. Once a qualifier reaches the top four players, the matches will be paused and played on the following day where they will be live streamed and broadcast for your entertainment. All matches will be live streamed via the ACGL YouTube Channel, subscribe now so you don’t miss a minute of the action! Consult ACGL for the stream schedule. Legendary League: The Legendary League takes place from the 14th to the 21st of October where matches will be live streamed every Sunday. Grand Finale: The Top 4 Players from the Legendary League will take to the Grand Finale on the 28th of October to compete for the R8,000 prize pool.